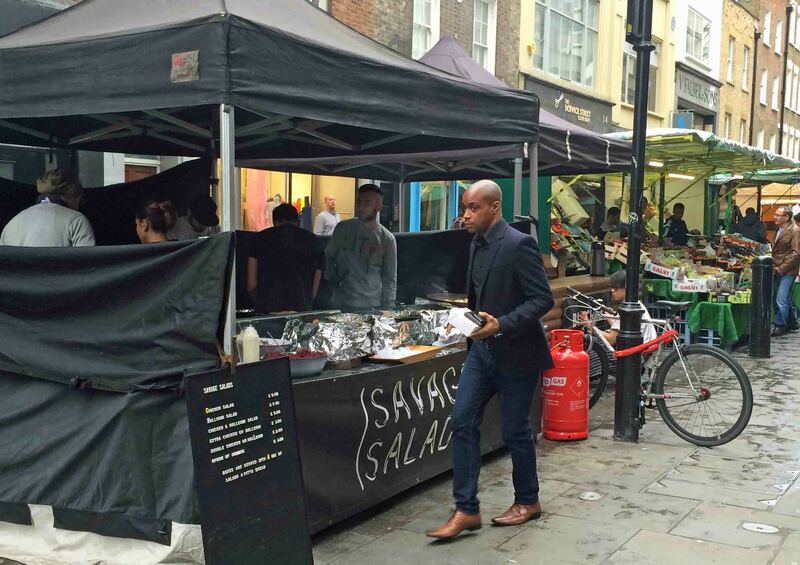 Avid readers of his blog will not be surprised to find DonQui in Soho. After all he made a promise to himself yesterday while wandering around Piccadilly. DonQui likes Soho. Full of eating, drinking and entertainment establishments there are plenty of possibilities for a decent lunch or a good night on the town. There are still even a few naughty places left over from its 1950s-70s heyday as London’s capital of sleaze, not that DonQui knows anything about such matters. Although rather gentrified now, there is just enough grit left for DonQui to feel that that the area has not become too sanitised. Bypassing the tourist hell of Piccadilly Circus and Leicester Square, DonQui heads straight for the back streets to the north of Shaftesbury Avenue. and even fish and chips; there is plenty on offer if you don’t have the time for a sit-down lunch. 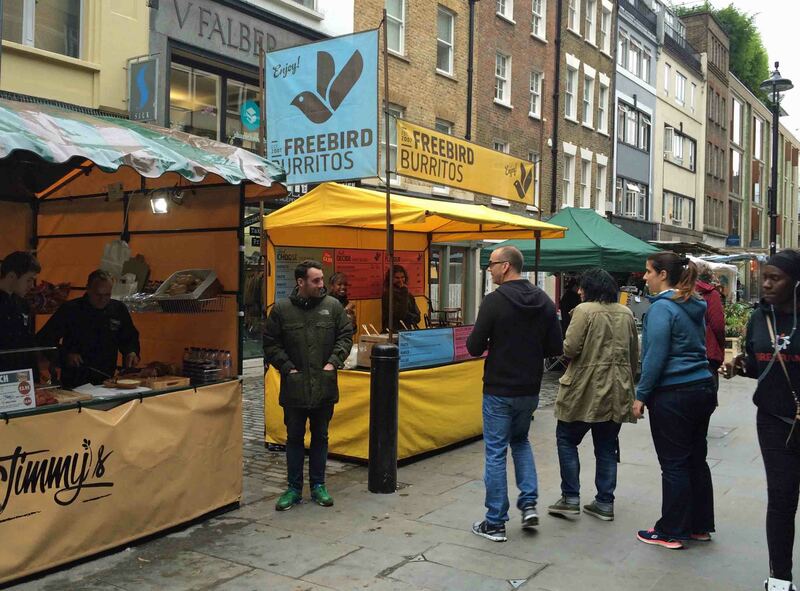 Before too long, DonQui finds himself on Dean Street. 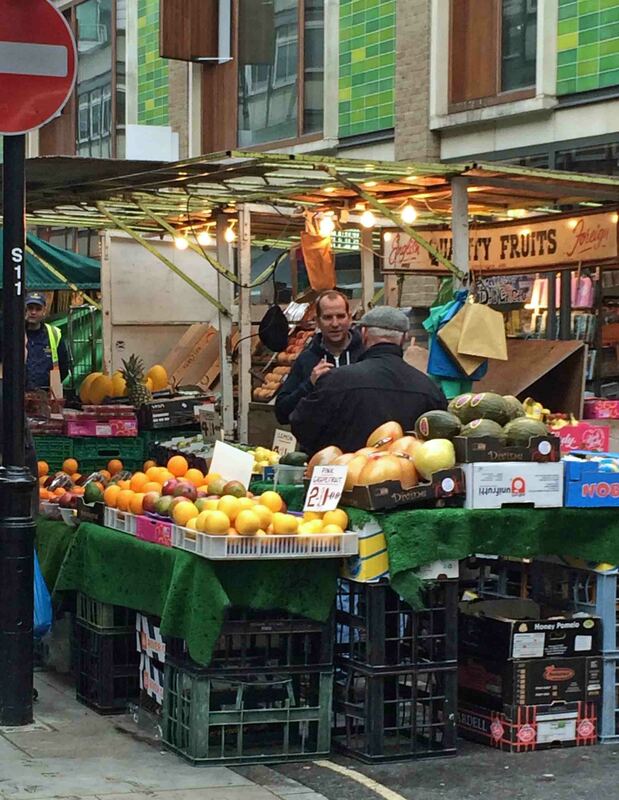 This is where he usually finds himself when he is in Soho as it houses some of his favourite stopping off places. 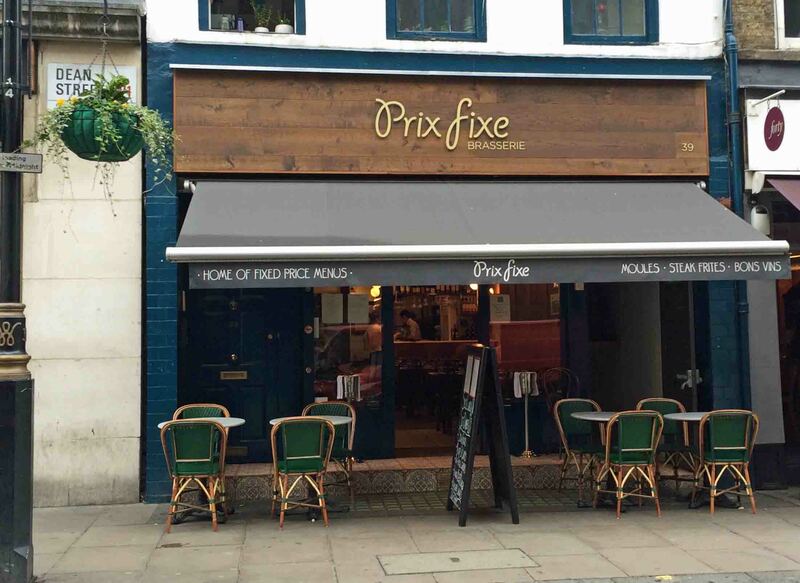 Prix Fixe is an excellent lunch or dinner spot in the manner of a French brasserie. 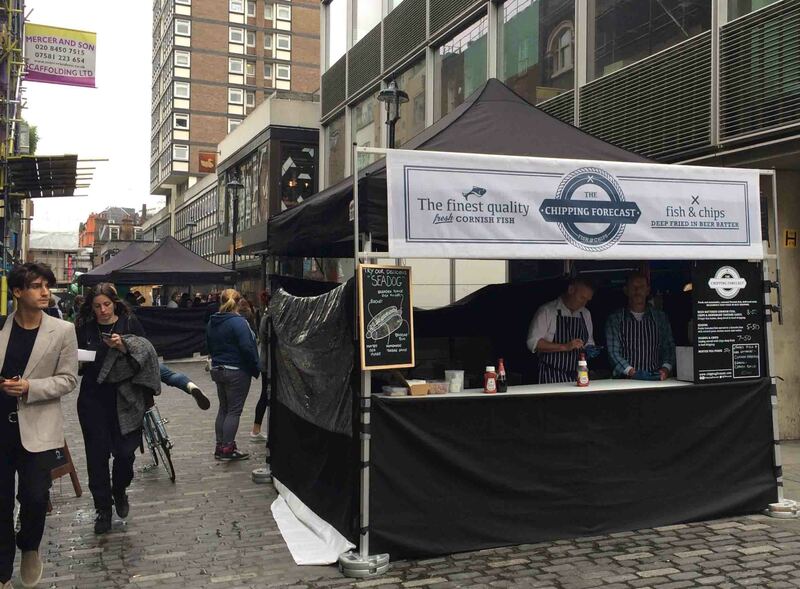 They have a set menu offering incredibly good value in a relaxed atmosphere. Inevitably DonQui ends up having a steak-frites as his main course. The frites are proper thin french style — crispy on the outside and soft in the middle. 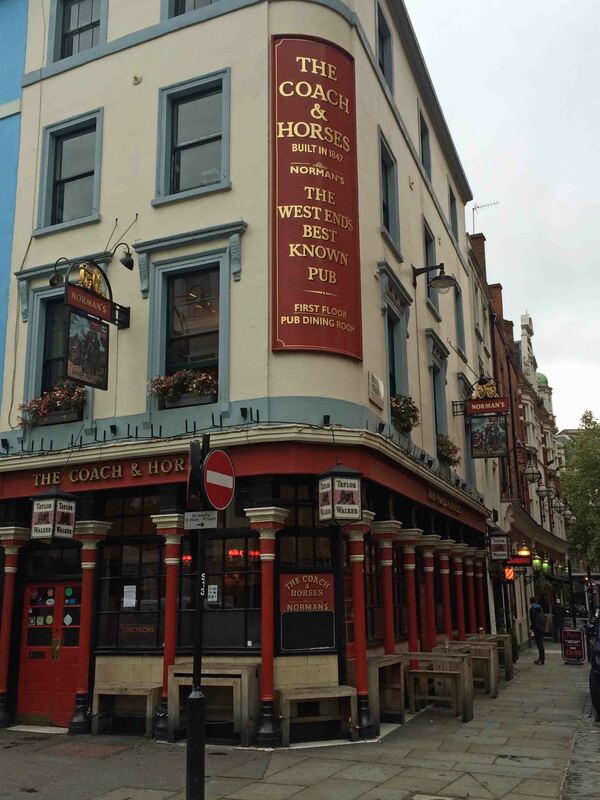 The French House, a bit further down Dean St, is one of DonQui’s favourite watering holes. During the second world war it was the unofficial headquarters of de Gaulle’s Free French and this is the root of the name. 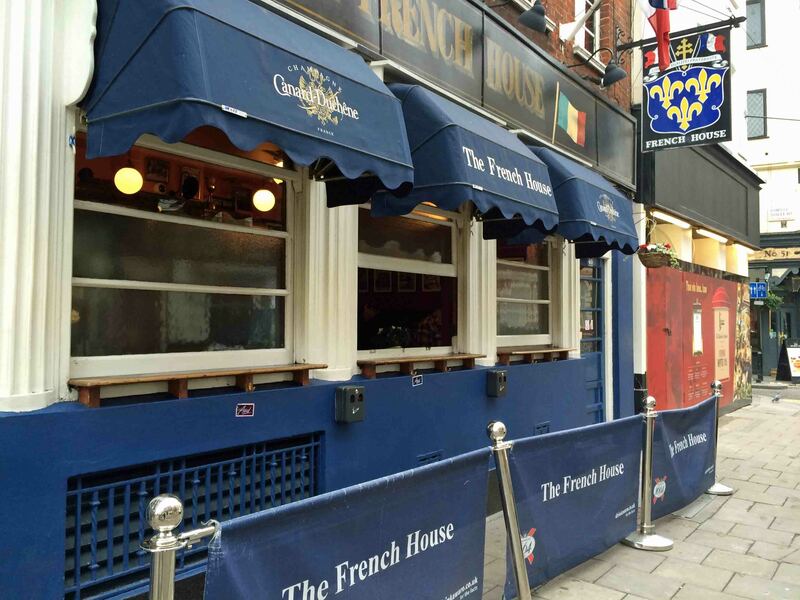 The French House still retains its character and is a perfect place to meet for a drink before going to dinner or for turning a lunch into an all afternoon affair. French and Belgian beers are on tap, served in half pint glasses only, and they also have some excellent Breton cider. Favoured by actors, writers, bohemians and all sorts or reprobates it is about as far as one can get from a blonde wood and chrome chain pub. There is no music, no slot machines, no sports on television and woe betide anyone who uses a mobile phone. Just the sort of place DonQui likes. The Coach and Horses around the corner on Greek Street used to be another haunt. 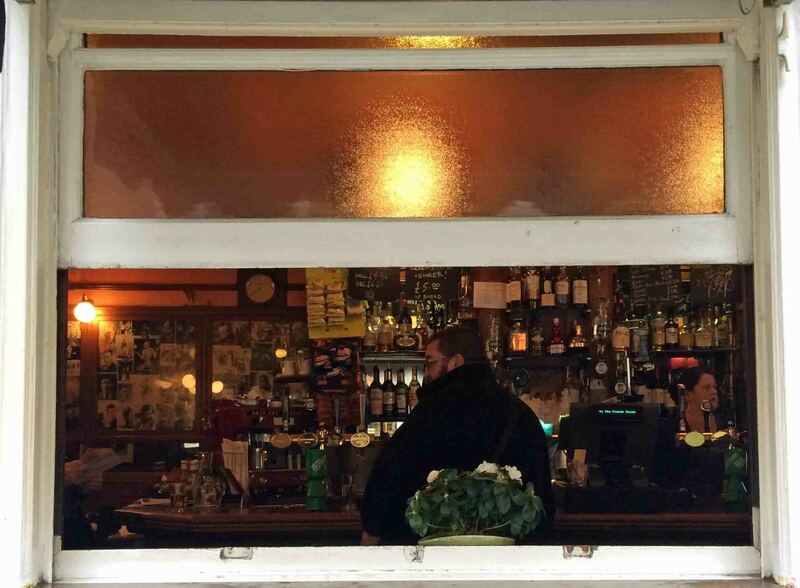 It was a ‘proper boozer’ and one of the few remaining Soho stalwarts. Sadly, since the departure of Norman in 2006, it has begun to tidy itself up. Norman, who ran the pub for 62 years was the self-proclaimed ‘rudest pub landlord in Britain’ and would not tolerate boring people nor anything that might get in the way of lively conversation or proper drinking. DonQui drops in for a quick pint and is horrified to learn that it has now become a vegetarian pub. He shakes his head in disbelief and thinks that Peter O’Toole and Francis Bacon (who were once regulars) must be turning in their graves. Andrew Edmunds 46 Lexington St for a cosy, intimate atmosphere, high quality food and a great wine list — a good place to take a date. Pizza Express 10 Dean Street for both good pizza and good jazz. Although DonQui generally avoids chains he makes an exception for this one. There is nothing chain-like about the Jazz Club downstairs. La Boheme 13 Old Compton St for a lively atmosphere from breakfast through to dinner and then late drinks. The public face of the original Soho House (once a fine members club and now an industry) it is a good place to go for the buzz rather than an expectation of exceptional or good value food. Ain’t Nothing But the Blues Bar, 20 Kingly St for a lively buzzing atmosphere and great live blues until the wee hours of the morning.